Opps meant to ask about the other colors too; what color of pink and yellow and aqua did she use…Thanks Jen in northern Wisconsin.p.s meant to add the room is empty and needs paint and a good sort of notions etc….I was thinking of placing one of those carts under my cutting table….wondering if it would fit too…the one that have 3 bins and made of metal. Thanks again. Gabby’s room is amazing though! My sewing room is so unimpressive! I’ve take over the spare bedroom as well as part of the basement and the dining room! So very busy. Couldn’t get here until Thursday but I’m here Finally!!! My son got his on Amazon Charger 2 Fitbit. Loves it! Hi from Marne, MI. I’m watching a day late. I looooove my I watch. It’s a Fitbit plus a ton of other features. Lasts about a day and a half. Just a thought, how about your logo painted in pink on the wall. 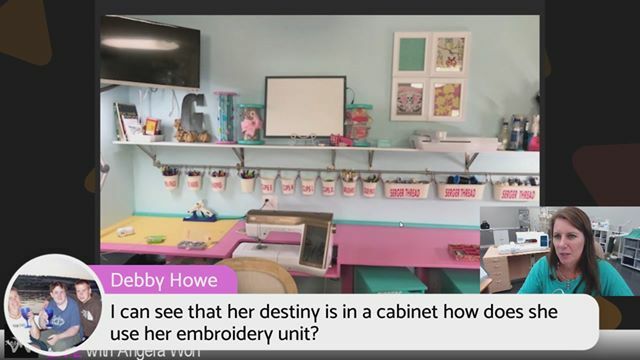 Can’t wait to use some of Gaby’s ideas in my sewing area! Those cabinets are not really wood. You can’t sand it. Thanks to Gaby for sending pictures and coming back on! I think a pink pegboard on your back wall would look great. Winn would not have to repainted your wall then. Couldn’t watch live today but, better later than never. I agree with Gabby? I do not like to dust either. Lol. I have my serger on the side table of my Horn cabinet. Back now to watch in peace. When I began watching earlier, I was in McDonalds with my little man. September 13th was my dad’s birthday. He was a very special man, so Winn must be too! Came in late,HAPPY birthday to Win. Love the ideas! Where did you find that great shelf/bin unit under your 10-needle? Love it! Angela – I am cutting a Kate Skirt on the bias. Do I have to cut the lining on the bias too? Good afternoon Angela, I fell asleep, so catching up now. Luv Gabby’s sewing room thanks for sharing, Loads of great ideas…Thanks Angie. Eileen here from Los Angeles! A huge WOW on her sewing/craft center. Even the colors. . . happy place. The sunrise maple color looks very pretty! Your space looks so organized and clean! Thanks for showing us your fabulous room Gaby! Check out FB group sewing room ideas. Put subject you are searching for in search and be amazed. Thank you again Angela for a great hour of learing! Loved the show! Bye. Have fun on Winns birthday! I just got my Brother 3550 and going to rewatch your Craftsy class after this live show ? Thanks for sharing, Hope everyone has a nice day & that your family is safe in North Carolina!! What is the address of the new place???? My Alta fit bit charges for one week. Charges fast. My Alta Fitbit only needs charged about once a week. I purchased a nicer band on Etsy. Yes have bought stuff from Harbor Freight. They also have rolling carts! Yes Harbor Freight does have the rolling carts! Love storage boxes from Freight Harbor! Amen. Fishing boxes are perfect for presser fit…and a lot cheaper than products made for sewing! I will take a pic of mine. I put my presser feet for another machine in zipper pencil bags inside a zipper folio notebook.